I've always felt I'd make a good waiter. Now I know I'm wrong. I, apparently, know nothing about what the "front of the house" is like, despite having dined in many of them. Dublanica starts off by recounting how he got into waiting. Something about a few rough patches in his career and needing something in the interim. Then 6 years later, he's still doing it, and has grown quite cynical. So cynical, that he starts an anonymous blog (now not so anonymous due to his fame) called Waiter Rant. There, he doesn't reveal his name or his restaurant (referring to it as "The Bistro") and proceeds to tell funny and detailed stories of what happens right before our eyes in restaurants. This secret-agent style blogging was intriguing to me and I wondered many times how his cover was never blown. Most of his stories involve a crazy colleague in the kitchen or on the wait staff. One of the reasons I realized I wouldn't really fit in as a waiter is I don't do cocaine or swear in Spanish (though that may be an American phenomenon). Some of the guests are no better, and Dublanica's observations about them make them more interesting. One such observation was that when married couples go out to eat as a couple, they don't actually want to talk to each other. So he aims to serve them first, make them happy, and hopefully get a larger tip. 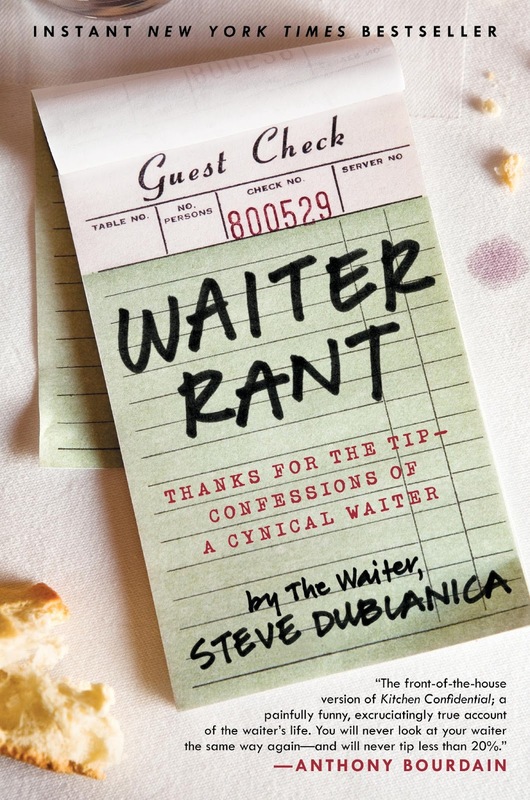 This is a light read and afterwards, if you're like me, you'll start wondering if every waiter out there is trying to wring you dry for tips. You may also start wondering who's sleeping with who, which ones are the aspiring actresses, and which ones didn't sleep last night because they were out partying, despite it being a week day. If anything, it's sure to make your future restaurant trips more amusing. Unless you're going with your spouse :).